Leave a comment on THIS post through Tuesday, September 13, 2016 to be entered in the DRAWING for a copy of the book below. If you mention in your comment that you’re a follower (see in the left sidebar “Join This Site” and “Follow by Email”), I'll add your name a second time in the drawing. U.S. mailing address required to receive a paper book. I may or may not have read books offered for giveaways. The mention and giveaway of books on my blog does not in any way indicate any manner of my endorsement of said books. Read book giveaway details at Disclaimers. To provide you security, please leave your email address like this: johnATyahooDOTcom. Winner announced in next Thursday's blog post. June Foster. June is a retired teacher with a BA in education and MA in counseling. Her characters find themselves in tough situations but overcome through God's power and the Word. She writes edgy topics wrapped in a good story. To date, she's seen ten contemporary romances published. 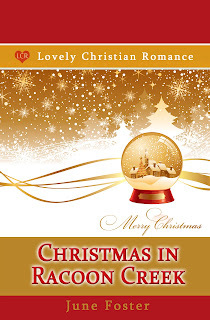 Enjoy June's article below about writing her novel, Christmas in Raccoon Creek. Christmas in Raccoon Creek represents a new venture for me. Here's why. 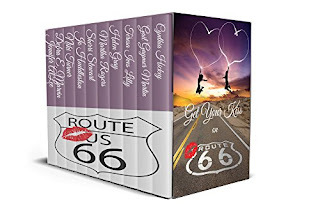 When I felt the Lord leading me to write Christian fiction in 2010, the stories in my head all fell into the category of contemporary romance. I love creating novel-length stories about Christian characters who experience the struggles we all face yet find freedom in their lives through God's power and His word. 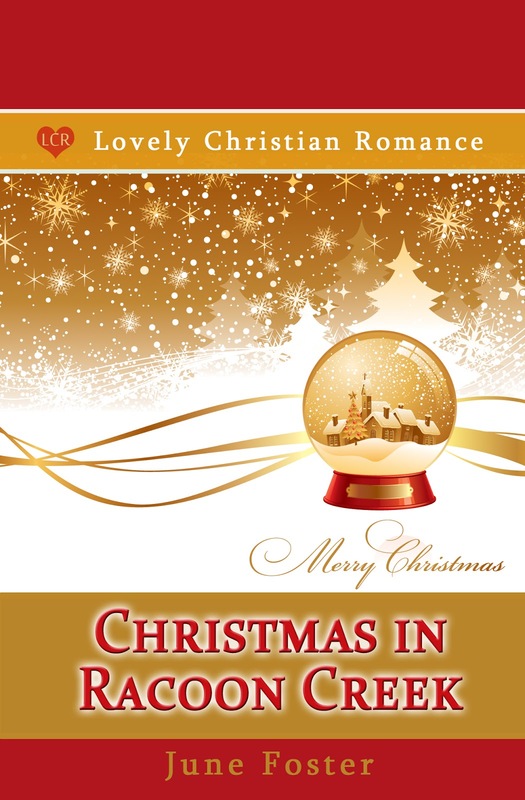 So when I answered the call to write Christmas in Raccoon Creek for Lovely Christian Romance, the project challenged my skills as an author since the genre is historical, set in the 1950s. In addition, it's a novella and the story must be told in fewer words. All my novels contain a spiritual theme. Christmas in Raccoon Creek is fun and upbeat. So what spiritual theme would this story possibly communicate, I asked? After only the third chapter, I knew. God's truth transcends the decades and the years. Hebrews 13:8 says "Jesus Christ is the same yesterday and today and forever." enjoyed writing it. Thanks to Teresa Lilly who created the idea for the collection. June, where can readers find you online? Where can readers purchase Christmas in Raccoon Creek? Thank you so much for allowing me to share my adventure in writing Christmas in Raccoon Creek, Jo. Do you have a snow globe amid your Christmas decorations? Is it different or similar to Emily's in Christmas in Raccoon Creek? June, thanks for visiting with my readers and me. One commenter to this blog post will be selected to receive an eBook copy of Christmas in Raccoon Creek that June has offered. Commenters, to enter the book drawing, please leave a comment through Tuesday, September 13, 2016 and remember to leave your email address so I can contact you if you're the winner. The winner of last Thursday’s blog post for a copy of Entangled by Julie Arduini is Marie. I’ll email you. Thanks all for commenting. Watch for more book giveaways. No, I don't have a snow globe as part of my Christmas decorations, but I used to buy them all the time when I was a little girl. I love snow globes and have a few with my Christmas decorations. They often take me back to remembering days gone by. June, you're most welcome. It's my pleasure to have you visit. Jennifer, thanks for stopping by and leaving your comment. I have a snow globe with Charlie Brown in it. There is something about snow globes that fascinates me. The book sounds wonderful. I love the era and think going back to her grandmother's days will be eye opening for her. Thank you for the chsnce. Deana, thanks for leaving your comment. I don't have ba snow globe. The book sounds like a good one. I have several snow globes, I love them. Thanks for the post Jo, (please dont enter me in the contest, since I am June's VA) I just love to read her interviews. Cindy, you're welcome. Glad you came by. Yes, I have several. One is of a Christmas Village.It actually looks a lot like the picture on the book cover! And I am a blog follower. Sonja, thanks for commenting. I appreciate you following my blog! Hi June, Christmas in Raccoon Creek sounds like a fun read. And I do have a snow globe in my Christmas decorations, but it doesn't look like the one on your cover. Enjoyed the blog. Blessings for the future. Vickie, glad you enjoyed the blog post. Thanks for commenting. I NEED YOUR EMAIL ADDRESS TO ENTER YOU IN THE BOOK DRAWING SO IF YOU WIN I CAN CONTACT YOU. June is a fantastic author and fabulous critique partner. I'm sorry I didn't get a peek at this novella yet. It will be on my list. I do have two snow globes--a couple of nativity scenes (what else would you have at Christmas?) Now that I live in Tennessee, I love them more because they bring the snow of northern NY, but I don't have to shovel it. Carol, I think the same of you. You're a sweetheart. Carol. thanks for stopping by and leaving your comment. I have a snow globe with a Nativity scene. It has Mary, Joseph and Baby Jesus. Thanks for this giveaway. I have a few snow globes, but none that are time transporters. This book sounds pretty fascinating. Kim, thanks for coming by and commenting. I appreciate all the comments about snow globes. Thanks, everyone. Hope you enjoy the story. I would love to read your lovely little book. I' in fact, have a snow globe that sits on my piano year round. It makes me smile to glance at it from time to time and see Santa all year long. I am a follower and always enjoy visiting Miss Jo. Thank you for the opportunity. Melanie, so glad you enjoy visiting my blog and appreciate you following it! Thanks for commenting. I remember a snow globe my Grandmother had. I loved to shake it to watch the snow come swirling down.